It’s Thursday so that means Vampire Diaries is on and that just makes me happy. You know what else makes me happy? 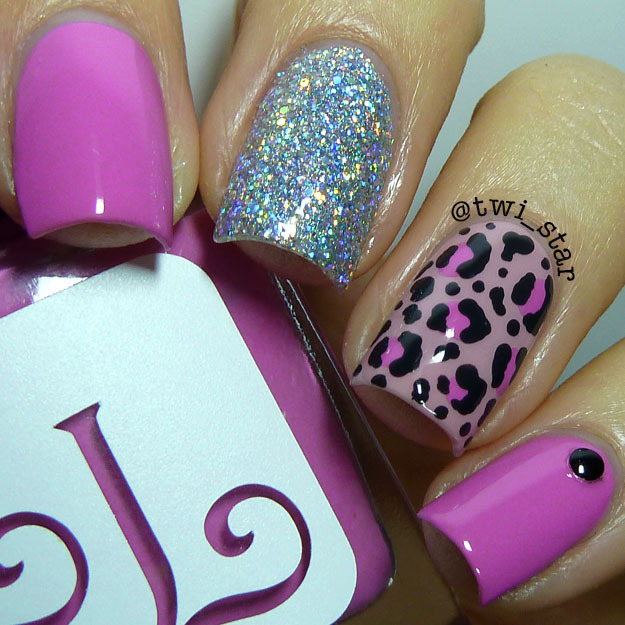 Leopard manis, the best right? And I have a new gorgeous polish from Lucky Lacquer to share. I bought a few LL polishes but I’m thinking this is my fav, it’s insanely gorgeous and a super great formula. This is Dahlia from Lucky Lacquer, I just love it so much. I’d call it radiant orchid ya know the pantone color of the year. All the Lucky Lacquer polishes I have have a decent formula but this one was really decent, like wonderful actually. Almost a 1 coater! But really, I never do 1 coat haha But if you apply carefully you could get away with 1 coat with Dahlia. For the leopard print I used a base of Lucky Lacquer Alpine Phlox, Dahlia for the inner dots, and then Julep Brandt for the outer ring. I’m gonna need another bottle of Brandt soon, I use it probably 3x per week for detailing. Alpine Phlox and Dahlia are a perfect match. The glitterbomb is my fav glitter from DIFFERENT dimension, Big Bang. 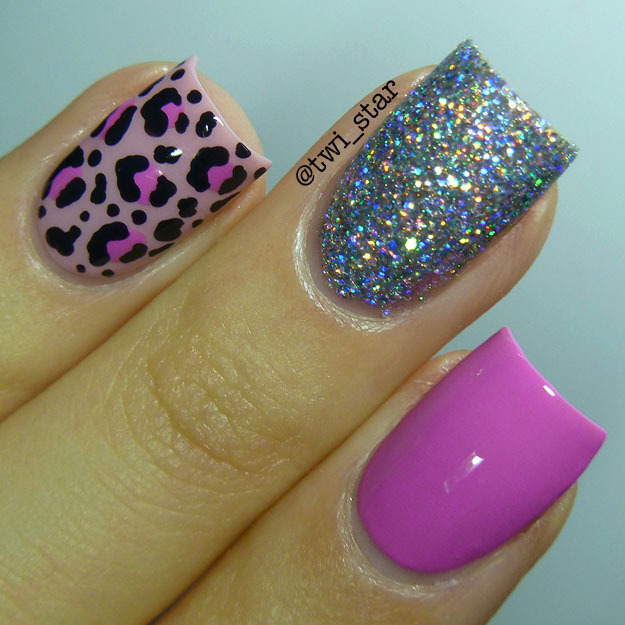 This is 2 coats of perfection, so glitter dense and opaque and you only need 2 coats so it doesn’t build up! Perfect. Basically you all need Lucky Lacquer Dahlia in your life, it’s one of my fav polishes I’ve bought in a while! AND you can use my code STAR for 10% off your entire purchase at Lucky Lacquer. Thanks for stopping by!